Chromecast vs. Roku vs. Apple TV: What’s the Best Streaming Device? Want to get some Internet-y video, be it a Netflix (NFLX) movie, a Hulu TV show or YouTube video, on to the biggest, brightest and best-viewing screen in the house, aka your television set? The options are multiplying after Google (GOOG) got back in the fray with its Chromecast plastic doohickey. But how does the 4-week backlogged $35 dongle compare to the competition? Somewhat similar capabilities are built into many Blu-ray players, gaming consoles and even high-end TVs. Chromecast's main competitors are the Apple (AAPL) TV and the Roku set top boxes. Prices for all three are pretty low -- $99 for the latest Apple TV or Roku 3 box and $35 for the Chromecast. Google’s dongle plugs into the back of a TV and the only way to control it is via Android or iOS smartphone or tablet apps or the Chrome browser running on a Mac, PC or Chromebook. The controls and interface thus vary from app to app. YouTube lets multiple people queue up videos, a fun feature for groups. Netflix controls are more basic. But you have to find an app for the content you want to get it going. Both Roku and Apple TV come with their own small, physical remote controls as well as specialized apps. That means they can offer bright, simple start screens on the TV that let users navigate between different content providers with the push of a few buttons. Accompanying remote control apps are good for text entry in a search field or wifi password log in. Apple’s app obviously only runs on iOS. Roku’s is on Android and iOS. Related: Google Chromcast: $35 Cable Industry Killer? This one is a moving target. As of today, Chromecast trails far behind its competitors in content deals that play directly from the Internet to the devices (we’ll get to streaming below). All three have Netflix. And other popular video services like HBO Go and Hulu are available on the two older boxes and are coming soon to Chromecast, too. But there’s a huge array of content for the two older boxes and it could take Google a while to catch up. For example, Apple TV has deals with the U.S. professional baseball, hockey and basketball leagues. Roku has the widest selection of channels by far and works directly with Amazon (AMZN) Instant Video, WalMart’s (WMT) Vudu service and many, many others. Roku lists its channels here. Oddly, YouTube, a mainstay of the Chromecast, is directly available for Apple TV but not for Roku. Only the Apple TV can access and play iTunes store content and only the Chromecast can get to Google Play content, obviously. The best way to watch video on any of the three units is via a direct connection. A movie or show streams over the Internet right to the unit, without having to go through other devices in the house – an extra step that can degrade quality, cause jumpiness or out-of-sync audio. But all three units also offer indirect streaming to help bring in an ever-wider array of online fun stuff. 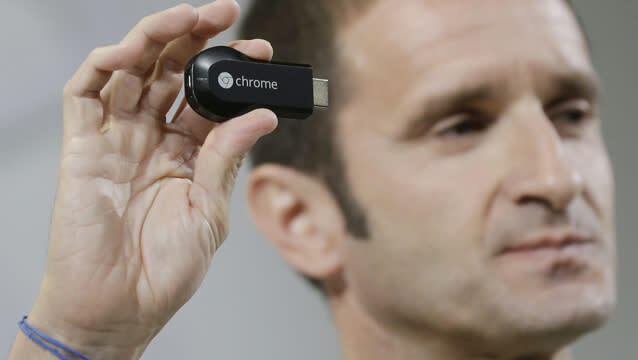 Chromecast can receive almost any web content, including video, that can play in the Chrome browser. So even though there’s no direct Hulu service for Chromecast yet via an app, a user could stream it from Hulu’s Web site. Apple TV can receive even more streams – almost anything running on a Mac as well as many iOS apps can use Apple’s proprietary Airplay feature to stream to a TV connected to an Apple TV. Roku can’t stream in that fashion but, unlike its peers, it does have a USB port and a microSD slot to access content saved on an external drive or memory stick.